Our eyes help us communicate with the world around. They also happen to be one of the first things you often notice about a person. You often make eye contact to feel a better connect with people around. In fact, there are many cultures where women have been decorating their eyes in different ways, to look and feel more attractive. But there is more to our eyes. They say that eyes are the window to the soul. And rightly so, as one look into our eyes can reveal what’s going on inside us – whether we are happy, sad, angry or tired, and even our personality to an extent. Our eyes and the skin around them are telling signs of our age too, and they can often give away our state of health and well-being. Age and time can cause a lot of changes to our skin – in terms of texture, pigmentation, loss of volume, elasticity, muscle action and fine lines – which can change the way our face looks. This is especially true of the skin area above, under and to the side of our eyes, as well as the forehead and temples. This skin is more delicate, and can start showing the first signs of ageing – like lax under-eye skin, crow’s feet and eye bags, tear troughs, dark circles and so on. But age isn’t the only factor that causes our skin to age. There are other factors too… like stress and lifestyle which can cause the skin in these areas to look aged and weary, giving us a perpetually tired, sad or angry look. Young people are also susceptible to this, due to their lifestyle choices like smoking, alcohol consumption or even due to genetics. And makeup doesn’t always help. There are times when it actually makes these look worse. The eye area assumes more importance as it can also influence a lot of our one-to-one communication in daily life. Rejuvenating the delicate skin around our eyes can change the way we look, and can give us a more youthful and happier appearance. And there are many methods for eye rejuvenation, especially in Melbourne. 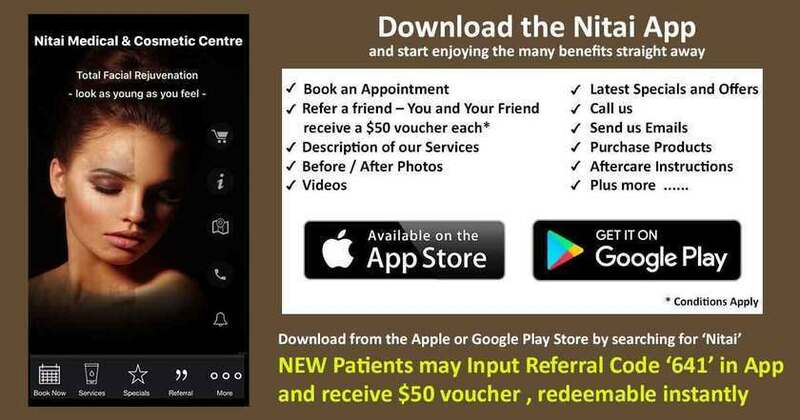 At Nitai Skin Clinic, our clinicians assess each patient individually, and take care to identify the right problems, and then choosing a suitable technique, or combining different techniques to give you the desired result. These are fine lines and wrinkles at the side of your eyes, which appear when you smile or make some expression. These are usually caused by sun exposure or excessive smoking or genetics. Frequent squinting or smiling could also cause this. Sunken eyes and undereye bags are common for a lot of people as they age, sometimes even afflicting younger people. These could also be caused due to sleep deprivation. Dark circles are caused due to the oxidization of haemoglobin in the capillaries around the eyes, which become more apparent as the under eye skin is thinner compared to the rest of the areas. Skin begins to lose its elasticity as we age, and this leads to loose, sagging skin around the eyes. Our eyelids could also droop down, giving a hooded look to the eyes. Under eye bags are caused due to accumulated fat behind the eye protruding from under the eye, due to a weakening of the tissue that held it in place, resulting in a puffy “bag” like appearance below the eyes. An early sign of aging, a tear trough is a fold that begins from the inner corner of the eye and stretches all the way out to the cheek – causing a dark shadow that creates a division between the lower eyelid and the cheek. This is an early sign of aging. Anti-wrinkle injections help to relax muscles, and reduce the appearance of creases and fine lines, especially around the forehead and upper eyelids. These injections, which are usually given around the frown lines and the forehead area, have been proven effective time and again, to fight signs of aging like crow’s feet and tear troughs. These work by relaxing the muscles that allow us to scrunch or squint and cause the skin to lose its elasticity, and develop fine lines. The effect of these injections lasts for up to three to six months, depending on the area treated. Dermal fillers can be used to fill out hollow areas like the tear troughs, as well as to reduce the puffiness of the bags. By adding more volume to sagging or hollow skin, dermal fillers are like an instant eraser that wipes away the dark under-eye shadows and the perpetual “tired look”. They help to smooth the transition between the lower eyelid and the cheek, thus giving the face a firm contour, and restoring a youthful appearance. Dr. Singh has developed a specialized technique to treat the area around the eyes. Browse through our gallery of treatment photos and videos. Choosing the laser way for eye rejuvenation is akin to turning back time. Lasers like Fraxel Laser and Revlite Laser are non-invasive and safe ways to treat this area (with a well understood risk profile). In this treatment, controlled pulses of laser light are administered to the affected areas which stimulate the production of superficial and deep essential substances for cell growth. They also help in skin tightening, reduce pigmentation and improve skin tone. Lasers are a good choice for those who wish to avoid the possible complications that surgery could give rise to. The best part about these is that they need little to no downtime. This treatment works with the principle that the body’s own natural healing process to slow down and rejuvenate the skin. It is a beautifully natural way to treat under-eye and upper eyelid fine lines and wrinkles. First, platelets are extracted from the patient’s own blood, using a process similar to a simple blood test. These platelets are then injected into the delicate area around the eyes to stimulate the skin’s natural cell growth factors and tissue growth, resulting in tighter, smoother and brighter skin. This is a popular regenerative treatment for dark circles. Depending on the severity of the condition, our clinicians may also recommend eye creams to lift the skin, reduce dark circles and nourish the skin around the eyes. We also recommend the regular use of sunscreen and sunglasses to protect the area around the eyes, and to avoid premature ageing. You can always be assured of complete transparency and commitment to your wellbeing at Nitai. Our clinicians will only recommend a procedure or treatment after a thorough consultation, to ensure that the results are in sync with what you are looking for. To know more about possible treatments for eye rejuvenation , and to book a no-obligation consultation, call us on (03) 9300 1244. This patient presented with severe forehead wrinkles and was treated with antiwrinkle injections by Dr. Shobhna Singh. The After photos were taken 2 weeks post-treatment. This patient presented with severe crows feet wrinkles and was treated with antiwrinkle injections by Dr. Shobhna Singh. The After photos were taken 2 weeks post-treatment. This patient presented with frown wrinkles and was treated with antiwrinkle injections by Dr. Shobhna Singh. The After photos were taken 2 weeks post-treatment. If you require assistance with your skin condition, we can help. Every patient presenting with a skin condition is reviewed by a doctor and an appropriate treatment and ongoing skin care plan is developed to suit your specific case.